Today is World Autism Awareness Day, a day when people across the world unite with a common goal – to raise awareness of autism and the challenges faced by those with autism and their carers. Today is also the first anniversary of my mother’s death and although I was devastated by her unexpected passing I take a lot of comfort in the association with World Autism Awareness Day. Why? Because for many years my mother taught a class of children and young teenagers with a range of special needs and they held a big place in her heart. She began this job in a temporary capacity back in the mid-eighties. The class had been set up but the school’s Board of Management was struggling to find a teacher who would take up the post. There was a lot less understanding of the specific needs of these children, and certainly no specialist training, no textbook to guide anyone who ventured into this uncertain world. My mother had carried out her teacher training during time spent in England, which meant that she was not qualified to take up a permanent teaching post in Ireland. But this didn’t stop her. She enrolled for a course that would lead to the required Irish language teaching qualification. With this accomplished, she was given a permanent position with the class, where she remained until her retirement 15 years later. My mother’s approach was simple. Each child was a unique person, with a unique set of skills and abilities and a unique rate of learning. She was told by school inspectors and educational psychologists that there were some things certain children could never learn. Undaunted, she divided everyday tasks into smaller and smaller steps and focussed on praising the achievement of each of these small steps. The ensuing results astonished so-called experts and gave hope to parents who had been struggling for help and support. Over the years, a number of children with autism came into the class. My mother seemed to know instinctively how to reach out to each one, though their needs communication levels were vastly different. After her retirement I heard her in conversation with a friend whose grandchild had recently been diagnosed with autism. “The most important thing to understand is that you must go right into the child’s world and see through his eyes instead of expecting him to fit into your world,” she said. The child’s mother later told my mother that the grandmother had passed on this advice and that it helped her through some tough days. 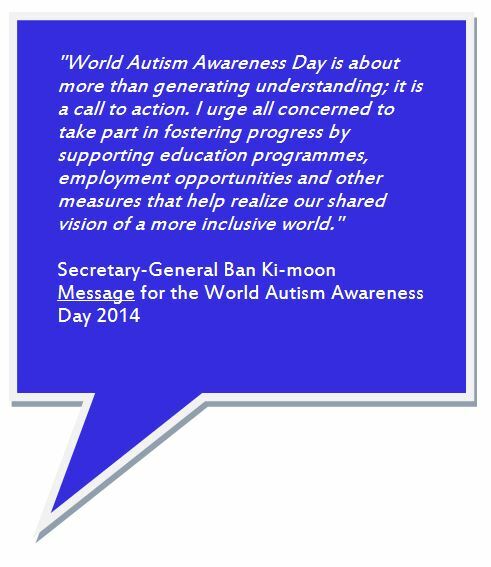 Autism is complex and challenging and difficult to come to grips with, but thanks to initiatives such as World Autism Day and to people who step forward to embrace a challenge rather than recoiling from it, understanding is growing. And after understanding comes progress. One of the most visual ways in which World Autism Awareness Day is marked is by turning landmarks blue. These range from globally-recognised structures to local churches, monuments and shops. You might also notice other initiatives in your local area, such as displays of blue flags, bunting, ribbons or artwork. This show of solidarity means a lot to people affected by autism, many of whom are caring for others who have no voice. Be part of the solution. None of us has a magic wand. We can’t change the whole world but we can each make our own little bit of it a nicer place to live. This entry was posted in Uncategorized and tagged Lanna McNamara, non-fiction, Siobhan McNamara, World Autism Day. Bookmark the permalink. Your mother is such a special person. I say is because though she has passed from this life, her spirit lives on in you, and the other lives she touched.